Project obstacles and solutions: Ball State University needed to replace an aging coal-fired plant with a campus-wide geothermal heating and cooling system. The project called for two power plants dividing the campus into north and south regions. The system uses water in a closed-loop pipeline as a source of heating and cooling. As the water is pumped deep into underground boreholes, it goes through a heat exchange process where it is naturally cooled to ground temperature. When completed, this pipeline will require a total of 3,600 boreholes. These underground pipes are connected to the two power plants with a massive pipeline distribution system, connecting 45 buildings over 600 acres. This is the largest geothermal system of its kind in the United States. The north project was the first to be installed. The project had three major phases. Messer Construction was hired to bore the holes for the aquatic heat exchange and cooling system. 3D Company was contracted to do the excavation and utility work on the site. Hagerman Construction built the Utility Distribution plant. There are a number of obstacles to overcome in a project of this scope and magnitude. For instance, a historical residential district adjoins the property line where heating and cooling pipelines were being installed. There was a concern that the vibration from backfill compaction would damage the foundations in the 100 year old houses. IMI solved this problem by supplying 4,600 cubic yards of imix Flexifill, a self-leveling, self-consolidating flowable fill. This product sets up quickly. 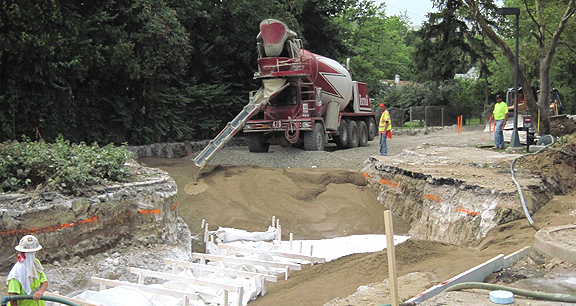 IMI covered the imix Flexifill with 12" of #53 stone and was able to drive mixer trucks on it in 30 minutes after placement. Another issue was the placement of the large number of boreholes this project required. This called for some creative planning. For instance, 700 boreholes were placed beneath a new parking lot. Messer drilled the boreholes 400' deep and approximately 5' apart. To further the green building impact of this project, the parking lot was built with asphalt banked to pervious concrete strips to drain and contain storm water runoff. E&B Paving supplied asphalt and curbing and Pridemark Construction placed 250 yards of imix Eco Pave pervious concrete. IMI also provided the aggregates for the subsurface aquatic storage and filter bed. The North Energy power plant construction was started in September 2010 by Hagerman Construction. IMI supplied 1,400 tons of aggregates and 1,200 yards of concrete for the initial work on this site. The first phase of the geothermal system is on target to be functional by December 2011. The $70 million system is scheduled to be fully completed in all buildings by 2018.